Turns Mario into Metal Mario. The Metal Cap is an accessory that makes its debut appearance in Super Mario 64. It is usually found in green ! Boxes, which will become solid upon pressing the green ! Switch in the Cavern of the Metal Cap course. The Metal Cap turns Mario into Metal Mario, which makes him invulnerable and extremely heavy. Because of this, he can no longer make very high or long jumps, cannot swim, and will sink faster in quicksand. However, Metal Mario is also unaffected by toxic clouds and cannot drown. The effect lasts for 20 seconds. If Mario gets another power when the Metal Cap is in effect, they will combine. This is possible in Dire, Dire Docks, where a Metal Box is located directly beside a blue ! Block, and in Wet-Dry World, where the player can drain the water in the Downtown area and collect the Metal Cap, then jump down and collect the Vanish Cap. Collecting both will give Mario the powers of both his Vanish and Metal forms. An unused texture in the game shows a metallic version of the wings from the Wing Cap, suggesting that it would've been possible to combine the Wing Cap with the Metal Cap as well. In Super Mario 64 DS, the Metal Cap does not appear. Instead, Wario becomes Metal Wario when he grabs a Power Flower but still retains the same properties as Metal Mario, and the music associated with the Metal Cap is retained. A similar item, the Metal Mushroom Orb from the Mario Party series, additionally transforms characters into metal forms. 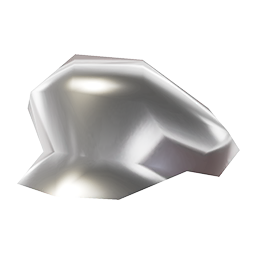 The Metal Cap (referred to as the Metal Mario Cap in this game) appears in Super Mario Odyssey as a cap that can be purchased from Crazy Cap stores, having a physical appearance similar to that of Super Mario 64. The cap becomes available after the player has collected 560 Power Moons, and costs 1000 coins. Aside from the ability to use the cap in conjunction with either the Mario 64 Outfit or the Metal Mario Outfit to enter a specific area in the Mushroom Kingdom, the cap is aesthetic and serves no other gameplay advantages. The Metal Cap music is a heavy metal arrangement of the "Powerful Infant" theme from Super Mario World 2: Yoshi's Island. This page was last edited on March 15, 2019, at 05:43.